I know that many of you participate in online quilting bees. I am in one bee currently - we have ten members and the bee is for ten months. I was feeling pretty good knowing that my month to "host" wasn't until January. Now I'm realizing that January is really just around the corner, considering that I have to have fabric packs shipped off in time (right over the Christmas rush, eek!) so that my bee mates can work on it during January. I thought it would be fun to look back at the blocks completed so far - all so different from each other, some were definitely a challenge, but all were fun and good accomplishments in and of themselves. I have a Pinterest board FULL of just quilt blocks - many of which I'm considering for my own month as bee mama in the new year. I also love this: http://www.flickr.com/photos/55389776@N08/8152407819/in/pool-1793590@N20 from the Modern Blocks book. 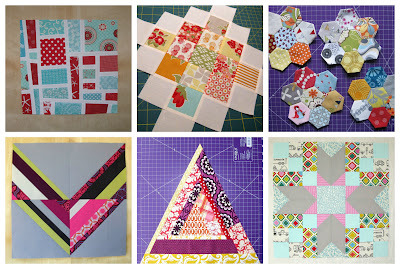 I also love the idea of an x and + bee quilt. So many possibilities! I struggle with how to put together wonky random improv blocks but I absolutely LOVE LOVE LOVE the way they look. Yours is great!! I'm still working on my very first bees. But everytime I'm drawn to a cool bee quilt, it's been something based on a loose theme... nautical or fairy tales are two I'd love to try. For easier/more common ones you can always go with flowers, stars, hearts, circles, etc. Give your group a direction and the fabrics you want them to use and let them put on their thinking caps. I love asking bees for large bee blocks so it doesn't take many to make up a quilt! But I really like giving my groups general directions (like stars) and letting them use their creativity. I usually have so many favourite blocks I can't decide! I know I don't do improv very well!! Great improv Heather! I have yet to try it...next year! Good luck in your block hunt! Love your improv block. Yes, you should do more, it looks great. Lovely improv block! I have only just joined in my first Bee group so will keep an eye on the replies here and check out the links too. Beautiful improv block. And love your granny square - so crisp and LIVELY! That improv block is fantastic! Nice work. I'm not in a bee yet, but I plan to be in the future so I've been keeping an out out. I have the book "Shape Workshop for Quilters" from Fat Quarterly. That's full of cool blocks perfect for bees (they all measure 12"). I like the Joseph's Coat block from there (by Brioni Greenberg) a lot. I think doing a block that's a little more time consuming or challenging for a bee is great, because they only have to make one or two and it might teach people new skills. It is crazy how fast time flies! I really like your improv block! The other blocks are really nice too. I love the variety! Your block looks great! Maybe I'll have to do a private swap with you to get another of my bee blocks for the quilt I'm working on! ;) My favourite bee blocks were the Mondrian-inspired blocks I made for the red and aqua bee. I love your improv block! 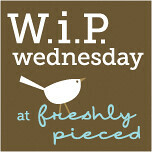 It is a different way to approach piecing for sure, but kind of nice to not have to measure as much.